Our all-inclusive summer resort experience includes all activities (two trail rides daily), meals and lodging. A-la-carte getaways are also available. Guests are encouraged to experience ranch life to its fullest. We offer horseback riding lessons, guided trail rides, a lunch cookout every Wednesday, chuckwagon dinner on the trail each Sunday, bullfrog catching, fishing, archery, trap shooting, s’mores by the campfire, karaoke, pool access, games, and much, much more. Inquire with us for rates on other guided activities like fly fishing, kayaking, stand-up paddle boarding, mountain biking and yoga. Read more about our activities. 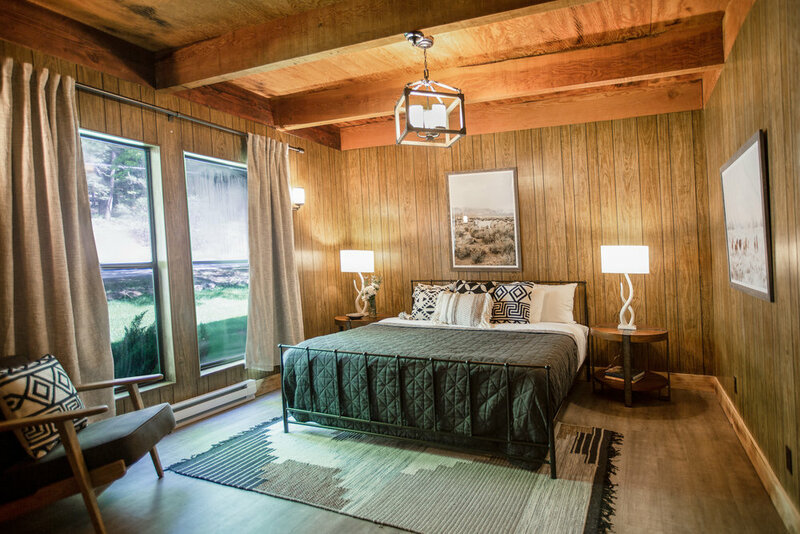 Rustic living meets modern design in our modest accommodations. Family-friendly and relaxed, kick up your boots and make yourself at home. Steps away from the saloon and the arena, hang your hat up for the night and leave your keys here for the week. The focal point of our 12-room, two-story lodge is the wood-burning fireplace and communal living space. Each room is secure with a new queen or king bed, desk, window, closet, furnishings, and a private in-suite bathroom. Each lodge room can sleep up to two adults. This is the perfect place to bring people together. Read more about gatherings at the ranch. Our creekside one-bedroom and studio cabins offer a little more privacy. These rooms accommodate four to six guests comfortably.